AMES, Iowa — A new technology for cleansing nutrients from water leaving Iowa’s tile-drained fields began with two Iowa State University researchers brainstorming after a professional meeting. Their “back of the napkin” discussion in 2010 led to development of saturated riparian buffers, a new conservation practice that is rapidly gaining interest in Iowa and far beyond. The challenge they were addressing – how to make traditional riparian conservation buffers more effective at reducing nutrient pollution – has since become a major research focus for Tom Isenhart, professor of natural resource ecology and management, and Dan Jaynes, a soil scientist with the USDA Agricultural Research Service’s National Laboratory for Agriculture and the Environment on campus and affiliate professor of agronomy. Research had shown that traditional riparian buffers, comprised of trees, shrubs and grasses planted along streams or drainage ditches, have multiple conservation benefits. They can stabilize stream banks, reduce erosion, provide habitat for wildlife and pollinators and sequester carbon. They also improve water quality as surface runoff filters through the buffer’s vegetation and soils. However, a riparian buffer can only purify water that flows through it. In Iowa’s agricultural landscape, extensive subsurface tile drainage systems often bypass traditional riparian buffers, routing water and pollutants underground directly to streams and drainage ditches. To address this problem, Isenhart and Jaynes created a system that intercepts drainage from tiles before it hits the stream. A new water control structure, or box, is installed, and perforated distribution pipes are connected to the box at a shallow depth. The structure directs a portion of subsurface tile drainage water into the buffer as shallow groundwater flow rather than discharging it directly to surface water. Their research results showed that the saturated buffers retain the multiple benefits of traditional riparian buffers, while filtering much of the nitrogen in the tile water. They even reduce nitrogen concentrations in the winter, when plants are not growing. Depending on many factors, including its size and the area drained, a saturated buffer can remove up to 100 percent of nitrogen from tile water, with an estimated average reduction of 40 percent, according to recently published research by Jaynes and Isenhart in the Journal of Environmental Quality, at https://dl.sciencesocieties.org/publications/jeq/pdfs/0/0/jeq2018.03.0115?search-result=1. What really matters more than the percentage of the nitrogen reduced is the total pounds of nitrogen removed from the water, the researchers say. During periods of high rainfall -- when more water runs through the tile -- the buffer may treat a smaller percentage of the water, yet can remove more of the overall pollutant load. “Ultimately, what makes the difference for water quality is reducing that load before it reaches waterways,” said Isenhart. Isenhart and Jaynes predict that saturated buffers will have a useful life of 20 to 40 or more years and are expected to become more effective as vegetation and soil carbon develop. They are likely to require minimal maintenance, mainly checking on the control structure and cleaning out roots every few years to prevent plugging. Research by Jaynes and Isenhart estimates the cost of installing a saturated buffer at about $4,400, depending on the site and size of the buffer. This represents about $1.34 per pound of nitrogen removed during the buffer’s life, similar to the cost for the amount of nitrogen reduction estimated for bioreactors and water-treatment wetlands. 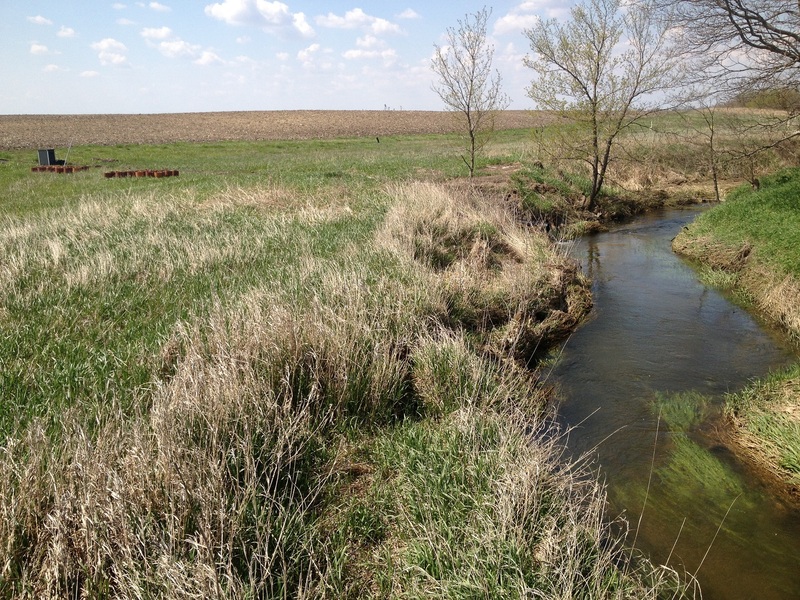 Thanks to the Iowa State researchers’ work, saturated riparian buffers were approved in 2016 as a conservation practice by the U.S. Department of Agriculture’s Natural Resources Conservation Service, making them potentially eligible for cost-share funds. The practice was also added to the menu of options promoted in the Iowa Nutrient Reduction Strategy. The scientists are aware of 15 saturated buffers that have been installed on Iowa State research farms and private land across the state. They have also heard from groups planning installations in other states, Canada and Denmark. With funding from the Iowa Nutrient Research Center at Iowa State, and other sources, the researchers have three projects underway looking at the impact of adding more distribution lines or other modifications that could bring more water into saturated buffers. Along with other Iowa State partners, they recently published findings that emissions of nitrous oxide, a greenhouse gas, were lower in saturated buffers than nearby fertilized corn and soybean fields. Another related project, also funded by the Iowa Nutrient Research Center, and led by Iowa State engineering faculty, is studying groundwater flow within the buffers, and how factors like soil type and retention time of water influences their effectiveness, in order to develop a model of saturated buffer processes. Besides the Iowa Nutrient Research Center, funding for the saturated riparian buffer research has come from the USDA Agricultural Research Service, the Leopold Center for Sustainable Agriculture, the Iowa Soybean Association, a USDA Natural Resources Conservation Service Conservation Innovation Grant, a USDA Agricultural Food Research Initiative grant, the USDA National Institute of Food and Agriculture and the Iowa Department of Agriculture and Land Stewardship’s Water Quality Initiative. A saturated riparian buffer, with the control structure in the background, filtering drainage from fields before it reaches a tributary of the South Skunk River. Photo by Dan Jaynes.